To effectively combat wholesale abortion in the United States, we must tear away the sham veil of legality from Roe v. Wade — because the entire edifice of abortion stands upon that foundation. The Supreme Court claimed to have discovered in the Constitution a “right of privacy,” which allowed abortions. With terrible irony, the Court rested its opinion on the Constitution’s due process clause. The irony consists in the unborn baby being utterly denied even the least semblance of due process. In our nation, due process has prevented the execution of many convicted murderers. But the unborn, deprived of both representation and due process, are convicted of nothing! Not even accused of the slightest misdemeanor, they are nonetheless ordered killed. Whereupon mercenaries hired for the purpose, and attired in white lab coats, carry out the death sentence. Biological science makes it impossible to argue convincingly that the unborn babies are anything other than human beings. Nevertheless, our Supreme Court ruling treats the unborn not as persons, but as property: just as Afro-American slaves like Dred Scott were ruled “property,” not persons [Dred Scott vs. Sandford (1857)]. Here is how Abraham Lincoln viewed the situation. When campaigning in Massachusetts he argued that the Democratic Party of the day had deserted Jefferson by holding “the liberty of one man to be absolutely nothing, when in conflict with another man’s right of property.” How much worse today, that one person’s life is absolutely nothing when in conflict with another person’s “right of property”. 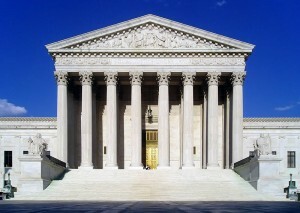 It is encouraging to discover that in at least three situations, Supreme Court decisions have been quashed, or canceled out, by Presidents who refused to act upon them; by Presidents who presented compelling reasons for refusing to obey; by Presidents who were unwilling to break the highest law of the land (the Constitution) by bowing to the Court! The Supreme Court’s function of absolute judicial review was initiated by our fourth Chief Justice, John Marshall, in the 1803 case Marbury v. Madison. This was the case wherein the newly elected President, Thomas Jefferson, directed his Secretary of State, James Madison, not to deliver the undelivered commissions executed but not delivered by outgoing President John Adams — thereby preventing certain Federalist “midnight appointees” from being seated in Federal courts. Curiously, even though the Supreme Court did not order Madison to deliver the commissions, Marshall used the case as the vehicle by which he announced the principle that the Supreme Court could annul any laws at all. Jefferson himself was a great lawyer — a statesman, not a litigator — who had rewritten, almost single-handedly, the laws of Virginia. His arguments against judicial usurpation in his day are very much applicable to the ideas and judicial dictums underpinning Roe v. Wade. Jefferson is a venerable authority to cite against the Court’s propensity to discover in the Constitution meanings that were neither intended by the Framers, nor evident to any reader of the Constitution who is conversant in the English language. Jefferson saw that if the Supreme Court claims the exclusive right to explain the Constitution, “then indeed is our constitution a complete felo de se [suicidal, self destructive]…. The brilliance of his penetrating intellect is displayed in his 1823 letter to Justice William Johnson. “On every question of construction, carry ourselves back to the time when the constitution was adopted, recollect the spirit manifested in the debates, and instead of trying what meaning may be squeezed out of the text, or invented against it, conform to the probable one in which it was passed. He saw also saw through the judicial jargon used to usurp the proper functions of the states. Can any good be effected by taking from the States the moral rule of their citizens and subordinating it to the general authority, or to one of their corporations, which may justify forcing the meaning of words, hunting after possible constructions, and hanging inference on inference, from heaven to earth, like Jacob’s ladder? . . . Laws are made for men of ordinary understanding, and should therefore be construed by the ordinary rules of common sense. Their meaning is not to be sought for in metaphysical subtleties, which may make anything mean everything or nothing, at pleasure. But the Chief Justice says, ‘there must be an ultimate arbiter somewhere.’ True, there must be; but does that prove it is either party? The ultimate arbiter is the people of the Union, assembled by their deputies in convention, at the call of Congress, or of two-thirds of the States. Let them decide to which they mean to give an authority claimed by two of their organs [e.g. Judicial and Executive, etc.]. And it has been the peculiar wisdom and felicity of our constitution to have provided this peaceable appeal, while that of other nations is at once to force. You seem in pages 84 and 148, to consider the judges as the ultimate arbiters of all constitutional questions – a very dangerous doctrine indeed and one which would place us under the despotism of an oligarchy. Our judges are as honest as other men, and not more so. They have, with others, the same passion for party, for power, and the privilege of their corps. Their maxim is ‘boni judicis est ampliare jurisdictionem’; and their power is the more dangerous as they are in office for life, and not responsible, as the other functionaries are, to the elective control. The Constitution has erected no such single tribunal, knowing that to whatever hands confided, with the corruptions of time and party, its members would become despots. Could we be right in applying Jefferson’s and Lincoln’s view that our nation is “under the despotism of an oligarchy”? Robert Struble, Jr., who writes for Catholic Lane, refers to the Supreme Court as our “Politburo.” Could Struble be right? Eight of today’s nine Supreme Court ‘justices’ are the product of either Harvard or Yale law schools. What about the Presidents who nominate these ‘justices’? George H. W. Bush graduated from Yale. Bill Clinton (and Hillary) got law degrees from Yale. George Bush, the son, went to BOTH Yale and Harvard. And Barack Obama – Harvard Law. Is this an oligarchy? What else can you call it? Mere precedent is a dangerous source of authority, and should not be regarded as deciding questions of constitutional power, except where the acquiescence of the people and the States can be considered as well settled. . . . If the opinion of the Supreme Court covered the whole ground of this act, it ought not to control the co-ordinate authorities of this Government. The Congress, the executive and the court, must each for itself be guided by its own opinion of the Constitution. Each public officer, who takes an oath to support the Constitution, swears that he will support it as he understands it, and not as it is understood by others. Most interesting, and applicable as well, is that the three Presidents who refused to knuckle under to the Supreme Court employed three different approaches. Jefferson regarded the whole Marbury business as moot, because the actions of Jefferson and Madison were done deals. Indeed Marshall took this same view; and the Marbury case actually was never decided: Marshall issued a sort of advisory opinion, which Jefferson rightly regarded as an outrage, because courts can only decide on cases which they actually try. Jackson took his stand on the principle Jefferson had enunciated, but had not invoked; namely that each branch of the Federal government had the responsibility to interpret the Constitution according to its own lights. But it was Lincoln whose position we might best apply in opposing the far-reaching effects of the whole government bowing to the Roe decision. For Lincoln, the Dred Scott decision did indeed apply, it had validity — but only with respect to the actual parties to that particular case. Lincoln accepted that whereas false assertions of ‘facts’ had been relied upon in reaching the decision, nevertheless it applied to the parties, but it did not apply beyond those specific parties. Today, we are justified in taking Lincoln’s position; perhaps with a taste of Jefferson’s moot thrown in. Add to that, the Roe decision did not confine itself to overturning the Texas law, which the Court found “vague:” the decision crafted guidelines which amounted to legislation for the whole country. Inasmuch as the legislation came from a court, the entire society was denied the opportunity to debate the issue of abortion, and to have our LEGISLATORS pass appropriate laws which would respect the views of the PEOPLE. The false “facts” and the tortured interpretation of the Constitution have led to devastating results. Aside from the moral, spiritual and psychological consequences — which don’t seem to matter to postmodernists — there is the absence of more than fifty million Americans from the workforce. Others pour into the country to take their place. Most of these others do not use abortion as their contraception. Thus we forfeit our right to keep this blessed country, and we come under the inevitable judgment of the righteous God. But “it ain’t over until it’s over” (Berra). We need to share the information indicated above; and begin, this election, to support ONLY candidates who vow to oppose all funding and all implementation of abortions. We may yet throw Roe v. Wade on the garbage heap of history. Then we can come before our Lord, and pray with confidence that he renew his blessings upon this land. I didn’t mention Franklin Roosevelt’s effort to pack the Court, so they would stop declaring his New Deal measures unconstitutional. He didn’t succeed at packing, but the Court quit shooting down his measures. The Supreme Court is VERY POLITICAL; it did not begin with the assault on Judge Bork. Deacon John, I don’t know what your comment is saying. If you reiterate it, all will become clear. You have a fascinating Deacon John’s Space. My wife and I join in your prayers for your wife. You are 74; I am a mere 69. You joined the Navy in ’54, I in 59. My sea duty was a WestPac on the Constellation. It is a fact that from the moment of Conception, nothing is added to the DNA of the son or daughter that has been created, and thus that son or daughter is wholly human and endowed with their unalienable Right to Life. Since it is true that every human being is a son or daughter, and it is true that every human being that is a son or daughter is a person, then, from the moment of Conception, personhood exists. Your argument is correct, of course, as is mine when I assert that “biological science” proves that unborn babies are human. But to be completely sincere with you, I believe these arguments are unnecessary. I was born in 1942. I always knew that unborn babies are human babies. Big deal! Everyone knew it. No one ever bothered to try demonstrating the fact. That accursed Roe v Wade decision was the first denial of babies’ humanity which I remember in my lifetime. Until the DNA proof, the abortionists strove always to use dehumanizing language — such as calling babies “products of conception” and “fetuses.” We all know instinctively that the unborn babies are human beings. As far as I am concerned, persons who deny that are either trying to salve their guilty consciences, or else have no conscience — or maybe they are just fools. As you might surmise, I hate abortion.